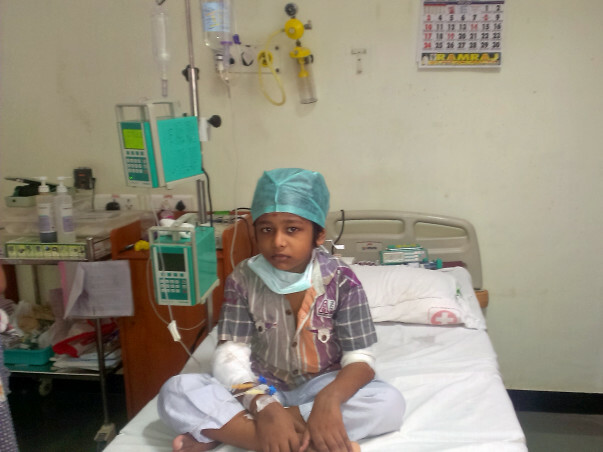 Balakrishnan is suffering from a serious blood disorder called severe Aplastic anaemia. In this disease bone marrow stops functioning ( Bone marrow failure ) leading to very low haemoglobin, white cell count and platelet count. The low blood count causes weakness, bleeding and severe infections. Untreated this disease is uniformly fatal. He was treated with Antithymocyte globulin. Unfortunately he did not respond to it. Only other option of cure for this child is an allogenic bone marrow transplantation. Since his sibling is not HLA matched, he is undergoing haploidentical (Half matched) bone marrow transplant with his mother as the donor. He has a 70% chance of cure and this is his only option available to cure him. The cost of haploidentical stem cell transplantation would be approximately Rs. 20,00,000. Unfortunately the family is unable to mobilize funds for his treatment. His father is a daily wage labourer. I request kind hearted people to help this child’s treatment. We are saddened to inform you that Balakrishnan passed away on Sunday at 8 pm. We received the news from the hospital. 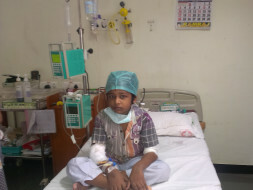 Balakrishnan's transplant was performed on 6th May at around 1 am. We spoke to Balakrishnan's father, Iyappan. The family was there in the hospital for over 5 months and no one imagined his condition would worsen since he was starting to make good progress after the transplant. But his blood counts did not not improve and he went into a very critical condition. 8-year-old Balakrishnan suffered from a severe form of a disease called Aplastic Anemia, a condition in which the body doesn't produce blood cells, thereby leading to problems like serious infections, severe anemia, and bleeding due to low platelets. He had already rejected the half matched blood stem cells taken from his mother. The only option to cure him was a bone marrow transplant from a fully matched donor. Because of your support we were able to procure these matched stem cells for Balakrishnan and transplant it to him. However, he had severe pneumonia due to his already low immunity and could not survive long enough for the transfused stem cells to be accepted by his body and start functioning. Though we were unable to save his life, we are grateful that he was able to get the best possible treatment. His family is from an economically challenged background but your support ensured he continued his treatment. His family and we at MMHRC would always be indebted for your unconditional support. 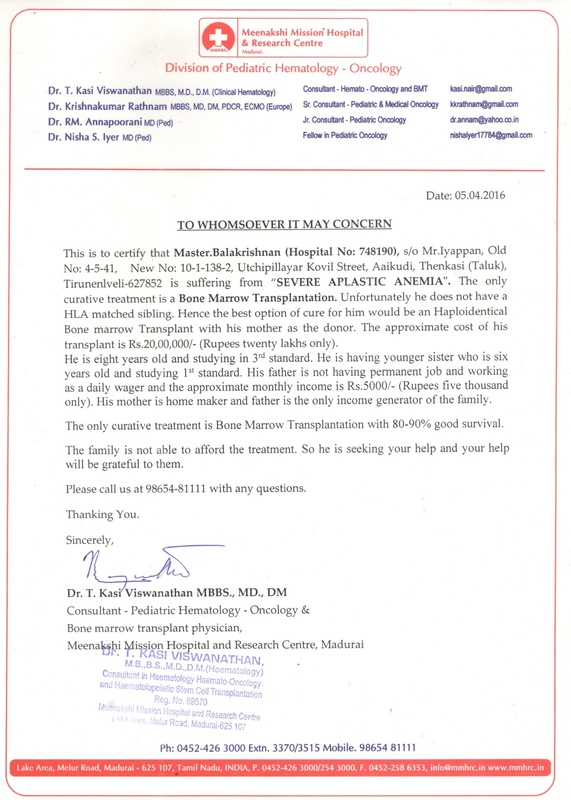 Funds were transferred to the hospital for the donor and transplant expenses. We are checking with the hospital team and if there are no pending expenses, funds remaining in Balakrishnan's campaign will be transferred to help another child. We will share the details of this shortly. Our hearts go out to the family. Let's keep them in our thoughts and prayers. May the little one's soul rest in peace. I would like to thank each and every one of you. With your valuable contributions and support, we have reached the goal amount (₹ 20lakhs) in 20 days' time. With your prayers and wishes, Bala will have a speedy recovery. A special thanks to the entire Milaap team. With your valuable support only, it could be done. We have a good news to share. Doctors have found a full match donor for Balakrishnan. He is undergoing chemotherapy and other medications at the moment. Stem cell collection will happen this Thursday and this will be followed by the transplant. Doctors are trying to prepare him for the transplant as he is weak and needs to fit for the transplant. Do keep him in your prayers. God bless this boy. Just hope even this lil' amount from me, adds like drops from the ocean. Take care, Bala and God bless you dear child. Just hoping He rids you of this disease ASAP. Please Lord. And thanks to you guys at Milaap. You guys are doing a fantastic job, in spite of your regular lives. God's choicest blessings be with you and your families, who support you in this noble cause. Thanks, Sanjay.